When I first started learning about wine, I knew I liked the red wines from Bordeaux. The only problem I had, back then, was that I really didn’t know what it was. There were so many different names and price points. How could anyone figure out what was good, and what tasted the best? This week, I am going to delve into Bordeaux. This will, in no way, be an extensive discussion of Bordeaux, but only the basics to get you started on your journey. Heck, novels have been written about this special wine region, and there is no way I could possibly fit all that information into a short wine blog. To begin, Bordeaux is a wine growing region, located in the southwest of France, in particular, along the west coast, and along the Gigonde Estuary. It was originally planted by the Romans. The geographical location was ideal for trading with the Dutch and English. It was eventually the Dutch who were able to drain the marsh land, expand the wine growing region The English connection was strengthened when King Henry II married Aliénor d‘Aquitaine, giving England control over the entire region. 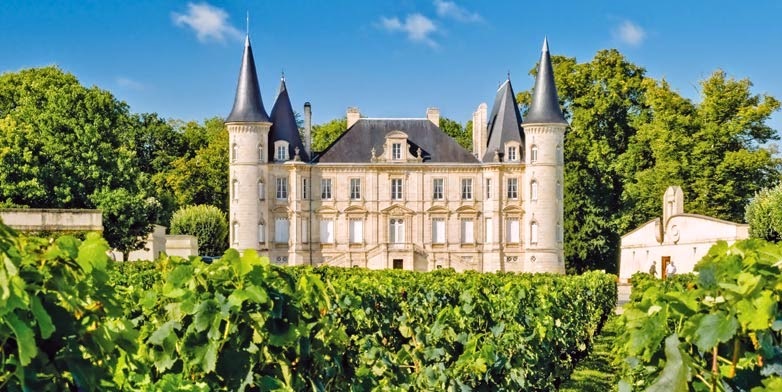 This English connection would weigh heavy on the style of wines created in Bordeaux, and develop a lucrative export market for the region. First, the Dutch influence. Prior to the Dutch, most of the vineyards were located an area known as Graves, Entre-Deux-Mers and the original growing regions of the Romans, on the right bank (more on that later). The Dutch had developed techniques for draining marshland, and making it usable. They helped drain the marshland along the Gigonde River, exposing large mounds of gravel that had piled up over the millennium. Little did they know that this would soon become some of the finest wine growing acreage in the world. By the mid 1800’s the “Château concept” had been developed. This concept may well be the first wine branding, based on the wine producers identity, rather than the soils the grapes were grown in. 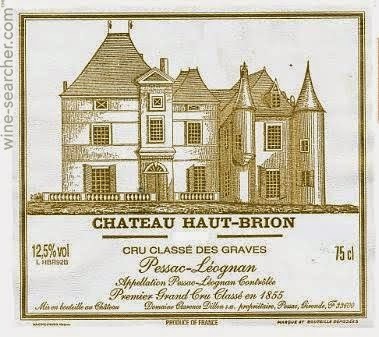 By the time of the Paris World’s Fair, in 1855, certain Château had gained recognition, and were classified (or divided) into categories that basically reflected the selling prices of the region’s wines, over the past 100 years. The thought was that the best wines would demand the highest prices. Among dry red wines, 4 were classified as Premiers Crus (1st Growth), 16 as Deuxièmes Crus (2nd Growth), and the balance were granted 3rd, 4th, and 5th growth status. 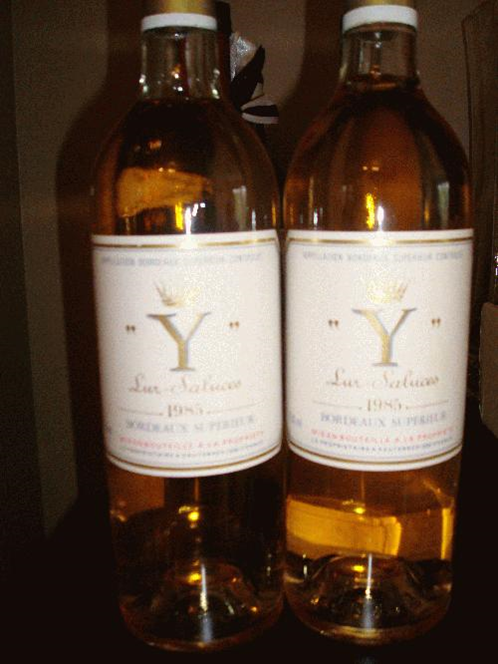 One sweet wine Château was given status of Premier Cru Supérieur: Château d‘Yquem. Since the official 1855 classification, there has only been one change. In 1973, Château Mouton-Rothschild was promoted from 2nd growth to 1st growth status. The Medoc wines that are in the 1855 Classification are known as "Crus Classés", or Classed Growths. The challenge with the 1855 classification, has to do with the “Château concept” itself. While these may have been the best wines in 1855, the land each owns has possibly expanded, owners may have changed, and even the style of wine may have changed. In other words, the brand name remains the same, but the product, and the source of the product may be different. Some that were rated as 5th Growth, may now be performing as good as or better than 1st Growth. Is this a reliable way to determine whether a wine is worth the high price? Maybe, maybe not. I will spend more time on the classification system of Bordeaux, in a follow up article. As I mentioned, Bordeaux is located on the Atlantic coast. This, along with the Gironde Estuary (created by the merger of the Garonne and Dordogne rivers), moderate the regions’ temperatures. The region is somewhat sheltered from the ocean breezes, by the Landes forest. The summers are long and mild, while the winters a cool and wet. The humidity, and cool maritime storms are the biggest challenge to growing in the Bordeaux region. The uncertain growing conditions meant that not all grape varieties would ripen at the same time, or even ripen at all. For this reason, many grape varieties are grown in Bordeaux, and the typical wines produced are blends of those grapes. The multiple varieties should be looked at as an “insurance policy”, to make sure there would be something at harvest to produce. 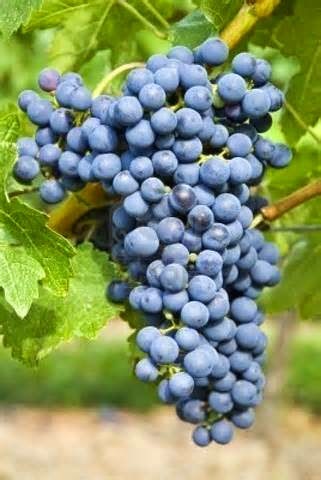 Early budding and early ripening varieties (such as Merlot) are combined with later-budding and later-ripening varieties (such as Cabernet Sauvignon). The rivers provide important geographical boundaries, and understanding their locations is important in understanding the various districts which comprise the region. If you have ever heard the term “right bank” or “left bank” for Bordeaux wines, this refers to a specific growing region. If you were floating down stream in on one of the rivers, the “right bank” would be on your right. Picture a large river, and if are going down stream, as the river bends, all the heavy material (rocks, twigs, etc.) is being pushed to the left side. On the right side, there is more limestone and clay. You now have an idea of the differences in soil type on the left and right banks of Bordeaux. Additionally, the right bank has less protection from the maritime climate, since it is more exposed. As you can imagine, this has an effect on the types of grape varieties that can be grown in each area. On the right bank, we find mainly Merlot and Cabernet Franc Vineyards. On the left bank, Cabernet Sauvignon dominates, and is supplemented with Merlot, Cabernet Franc, Malbec, and Petit Verdot. White grapes are also grown, but are mainly found in the Entre-Deux-Mers region. Here we find Semillon, Sauvignon Blanc and Muscadelle. Some of the finest dessert wines in the world are found in Sauternes. Hopefully the left bank versus right bank makes more sense now. To complicate things further, within each region, there are districts, which can be further broken down into communes. The analogy I have used in the past, is the Russian nesting egg. You have a large egg, and inside is a smaller egg, an inside that is another small egg, etc. Each time you get to a smaller egg, you are getting more refined. The same is true for the wines of Bordeaux. 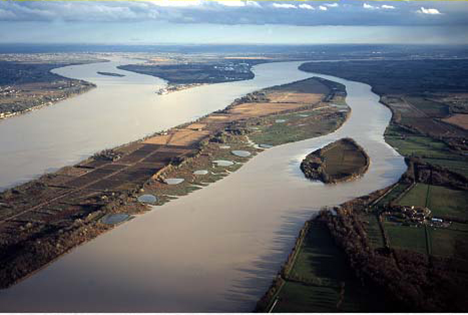 The larger districts on the left bank (from west to east, or downstream to upstream) are: Médoc, Haut-Médoc, and Graves. On the right bank, they are: Cotes de Blaye, Canon Fronsac, Pomerol , and St. Emillion. Between the rivers is Entre-Deux-Mers. 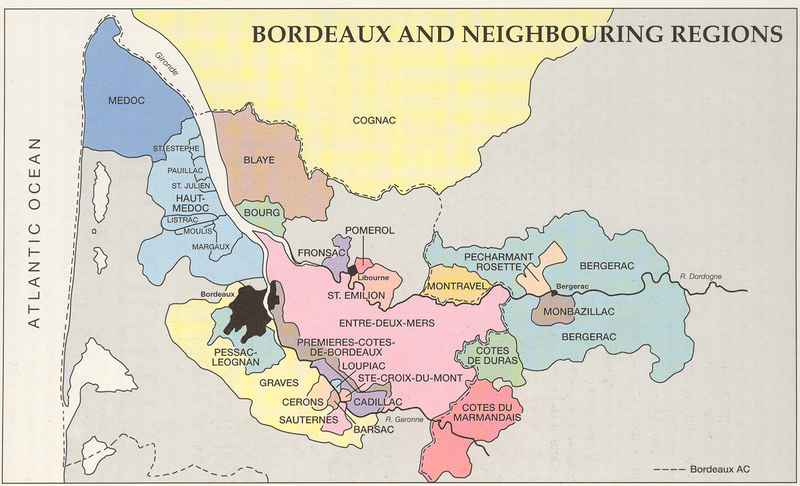 The most specific designations within Bordeaux are the communes. These have the strictest regulations concerning winemaking, and grape growing. These are typically the finest wines of Bordeaux. Some of the best known on the left bank are St. Estephe, Pauillac,, St. Julien, Margaux, Pessac-Leognan and Sauternes. There are too many differences between these communes, to spend any reasonable time discussing in this article. I see an opportunity for a few future articles! As stated at the beginning of this article, there is a lot of information required to understand Bordeaux. This is just the tip of the iceberg of what there is to know about the region, but the best way to learn is to taste, and see for yourself what the differences are. Next week, I will spend some time on the different classifications within Bordeaux. First up: The 1959 Graves Classification.